Last night, when I spoke with you about the fall of Rome, I knew at that moment that troops of the United States and our Allies were crossing the [English] Channel in another and greater operation. It has come to pass with success thus far. They will be sore tried, by night and by day, without rest – until the victory is won. The darkness will be rent by noise and flame. Men’s souls will be shaken with the violences of war. And for us at home – fathers, mothers, children, wives, sisters, and brothers of brave men overseas, whose thoughts and prayers are ever with them – help us, Almighty God, to rededicate ourselves in renewed faith in Thee in this hour of great sacrifice. Give us strength, too – strength in our daily tasks, to redouble the contributions we make in the physical and the material support of our armed forces. And, O Lord, give us faith. Give us faith in Thee; faith in our sons; faith in each other; faith in our united crusade. Let not the keeness of our spirit ever be dulled. Let not the impacts of temporary events, of temporal matters of but fleeting moment – let not these deter us in our unconquerable purpose. With Thy blessing, we shall prevail over the unholy forces of our enemy. Help us to conquer the apostles of greed and racial arrogances. Lead us to the saving of our country, and with our sister nations into a world unity that will spell a sure peace – a peace invulnerable to the schemings of unworthy men. And a peace that will let all of men live in freedom, reaping the just rewards of their honest toil. 1. After reading President Roosevelt's words, listen to his address in the video under "Resources" below. What was the main idea of President Roosevelt's prayer when he addressed the nation on the evening of June 6, 1944? 2. 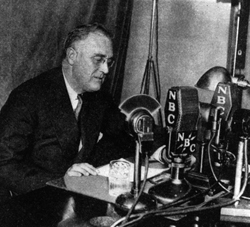 How do you think President Roosevelt's address and speech to the nation inspired Americans? 3. a) Why do you think President Roosevelt acknowledged God, and prayed "help us, Almighty God, to rededicate ourselves in renewed faith in [You] in this hour of great sacrifice"? b) In his address, President Roosevelt asked the people to pray without ceasing. He said: "Many people have urged that I call the nation into a single day of special prayer. But because the road is long and the desire is great, I ask that our people devote themselves in a continuance of prayer. As we rise to each new day, and again when each day is spent, let words of prayer be on our lips, invoking Thy help to our efforts." Why do you think he urged Americans to do this? 3. Listen to President Reagan's speech on the 40th anniversary of D-Day (under "Resources" below). a) What was the tone of President Reagan's speech? b) What was the focus of his speech? On June 6, 1944, 160,000 Allied troops landed along a 50-mile stretch of heavily-fortified French coastline to fight Nazi Germany on the beaches of Normandy, France. General Dwight D. Eisenhower called the operation a crusade in which "we will accept nothing less than full victory." More than 5,000 Ships and 13,000 aircraft supported the D-Day invasion, and by day's end on June 6, the Allies gained a foot-hold in Normandy. The D-Day cost was high - more than 9,000 Allied Soldiers were killed or wounded -- but more than 100,000 Soldiers began the march across Europe to defeat Hitler.